Home The Arts Silhouettes by Cindi Featured on Examiner.com! Silhouettes by Cindi Featured on Examiner.com! The typical answer you’d receive if you asked a little girl what she was going to be when she grew up would not be, “The most accomplished freehand silhouette artist in the world.” Unless, of course, you asked that question of Cindi Harwood Rose. Cindi’s artistic talents displayed themselves at the tender age of two, but she didn’t discover her talent as a silhouette artist until she was 15. Intrigued with a silhouette artist at AstroWorld, she told the art concession manager that she could “do that”, although it was an art she’d never seen done before. He was amused since there were only 50-60 silhouette artists worldwide, but told her to try her hand at it. She did…and was hired on the spot to replace the existing silhouette artist. 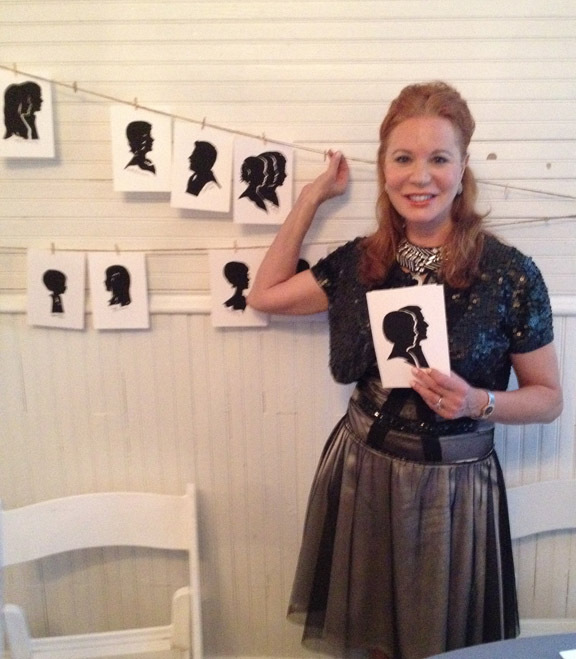 Cindi’s talent is unique in that it isn’t a skill that can be taught, a lesson she learned at one point in her career when she attempted to train others to become silhouette artists. It’s truly a gift. silhouette artist, silhouettes by Cindi. Bookmark. Superior Silhouette Artist Cindi Rose, Sultry Singer Ashley Forrest and Comedian Don Barnhart are Winners!